The invasive predators partly responsible for last year's 21% drop in clam landings are difficult to combat, but one scientist may have an answer – aquaculture. Clammers face a shrinking harvest again this year after predator green crabs survived the mild winter, but one scientist may have an answer – aquaculture. 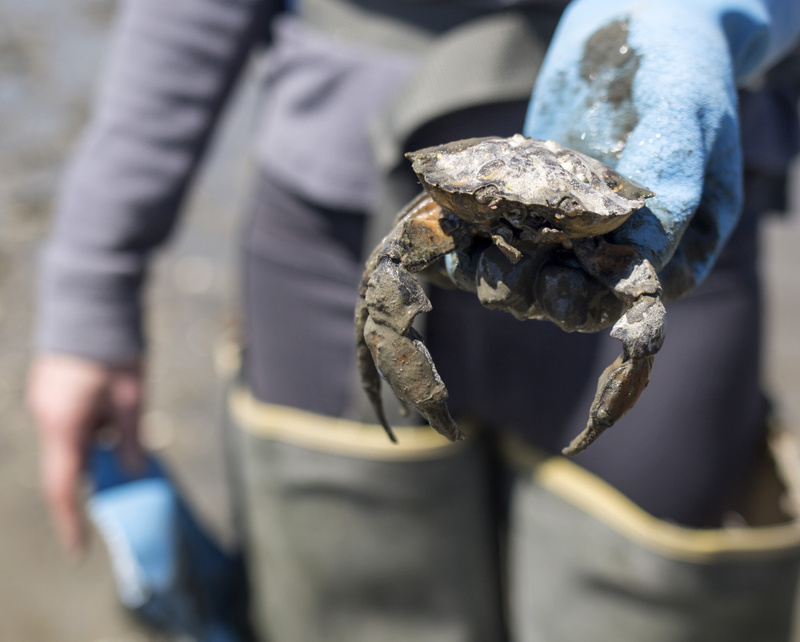 The second mild winter in a row means Maine’s tidal flats will likely be overrun by large, ravenous invasive green crabs this summer. That’s bad news for the state’s already weakened soft-shell clam industry. One green crab can consume 40 half-inch clams a day and will dig 6 inches to find clams to eat. In 2016, clam landings fell 21 percent, from 9.3 million to 7.3 million pounds, the lowest total reported since 1991, according to the state Department of Marine Resources. Some of the landings decline was undoubtedly a result of an unusual bloom of toxic algae that forced a monthlong shellfishing ban along about a third of Maine’s coastline last fall. But researcher Sara Randall of the Downeast Institute in Beals notes that a review of clam landings in towns with traditionally high numbers south of the Deer Isle-Stonington closure line found that 19 out of 24 towns, or 79 percent, had harvested fewer clams. For example, from 2015 to 2016, landings fell 35 percent in Harpswell, 87 percent in Yarmouth and 21 percent in Scarborough. In Freeport, a town on the front line of the effort to combat the green crab invasion, landings decreased 17 percent despite efforts by municipal officials, clammers and researchers like Randall, among others, to use protective measures such as nets and other tools to ward off the green crabs. The mild winter may only make matters worse. 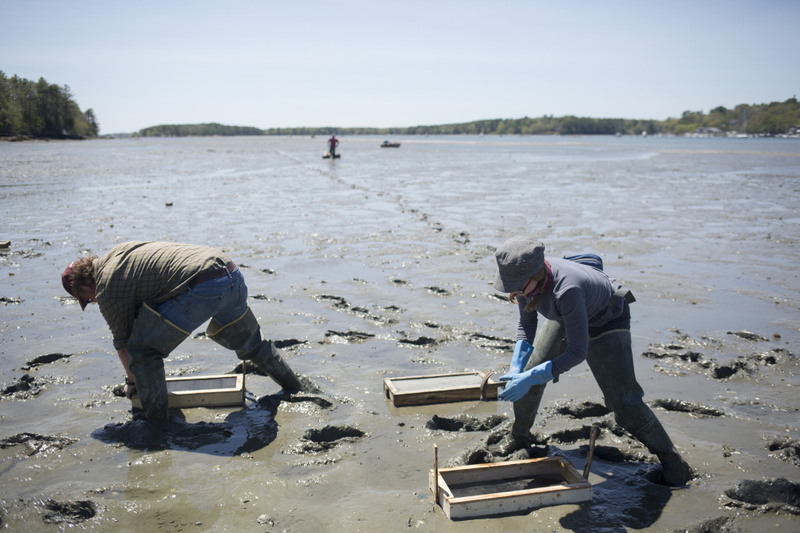 Clammers had hoped for a cold winter so the deep freeze and ice would kill off a lot of the crabs, allowing the clam seed still found in high numbers in Maine waters a chance to settle in the tidal flats and grow, forming those telltale tiny holes that tell clammers a harvest awaits them under the mud. But this winter, Freeport clammer Chad Coffin, president of the Maine Clammers Association, saw green crabs active throughout the winter, with some even bearing eggs or in soft shells, which is a sign of recent molting. Neither of these usually happens in the cold of winter, which means there will be more crabs on the flats this year looking for dinner, and that many of those will be larger than in years past and thus able to eat more. 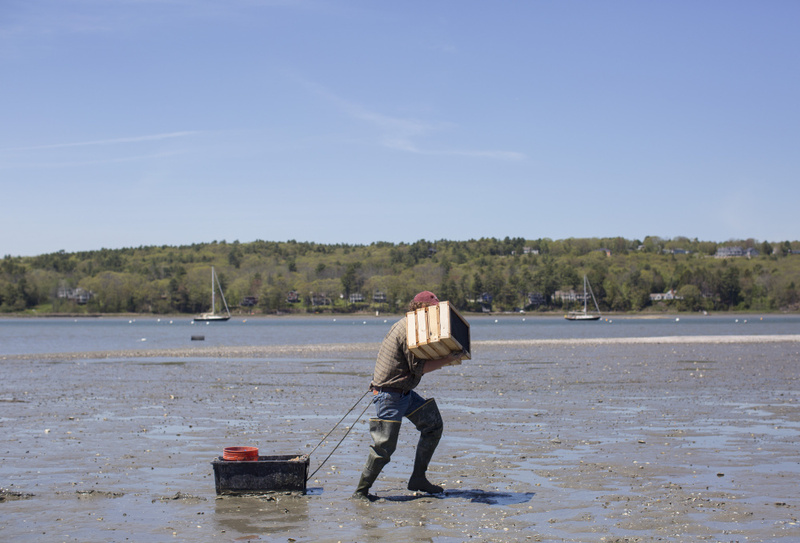 As clam harvests become more unpredictable, Coffin said the once-thriving clamming culture is fading, and the infrastructure that brought clams to market slowly disappearing. Buyers are leaving the industry and restaurants are writing the summer favorite off their menus, unsure if they will be available on any given day. Scientist Brian Beal carries his experimental clam boxes on the mudflats of the Harraseeket River. Beal says that hoping a winter deep-freeze kills off predator green crabs is not the way to save Maine’s clamming industry, but aquaculture may be. Clammers may yet see a good harvest this year. As the number of clammers decline, those who remain can harvest a bigger share of the smaller harvest. In 2017, they will be harvesting clams that made it from seed to juvenile status because of a cold winter in 2013-14 that killed off many green crabs. As a result, the clams were able to grow big enough, with thick enough shells, to survive predation and fill clammers’ bags. The clammers who remain hope to make a living off that population until the next deep freeze comes along. But unlike in 2015, when scarcity drove prices up over $2 a pound for the first time, the value of Maine soft-shell clams fell 31.5 percent in 2016. Soft-shell clams sold for an average of $2.13 a pound last year, compared with $2.46 a pound in 2015. But that’s still more than clammers dreamed of just 10 years ago, when clams sold for an average of $1.43 a pound, and more than enough to keep some clammers coming back for more. And holding their breath for another cold winter. The scientist who is leading efforts to find a way to save the iconic industry believes there must be a better way. Warming waters in the Gulf of Maine have allowed the invasive green crab, above, to proliferate. One green crab can consume 40 half-inch clams a day. While clammers like Coffin embrace Beal’s scientific findings, others denounce the suggestion that they turn to farming clams in small plots of carefully protected flats, possibly leased from the landowners who control access to the upper tidal flats, to keep the industry alive. The old ways still work for them, they say. They question his science and his motives, often in raised voices at local shellfish commission meetings. But Coffin has seen the empty netted boxes, built by Beal on Freeport flats that were once thought dead, yield thousands of clams in the protected silt come fall. Here’s how it works: High tide brings the floating clam larvae to the flats. The microscopic seed can pass through the netting – which is just large enough to let the clams pass through but small enough to keep the crabs out – to settle in the box. The flats around the box, left unprotected, are empty of clams come fall, but not the netted boxes. There have been some kinks. Beal has had to put bottoms on the boxes to prevent milky ribbon worms from coming up through the mud from below to eat the baby clams. Not every spot has been as productive as others, although the silt inside the boxes has always yielded far more clams than outside. And the boxes are still too small to yield a commercially profitable crop, although he plans to test larger boxes this summer. But the evidence was more than enough to persuade Coffin that this is the future of his industry. The ocean temperature is warming, faster in the Gulf of Maine than almost anywhere else in the world, and deep-freeze winters are likely to become rarer in the future, he said. But it will be a difficult change for an industry that has remained essentially unchanged for generations, Coffin said. Many shellfish commissions that control licensing on the flats are made up of clammers who still cling to the old ways, he said. The riparian landowners who control access to the upper tidal areas where would-be farmers could set up protective boxes want to keep their ocean views free of farming plots and the farmers who would tend them.